Is Your IT Company Talking to You About Security Vulnerabilities in Your Line of Business Code? Having a conversational partnership with your IT company is incredibly important to running a fully functional business and staying protected. Does your IT team talk to you regularly about how they’re keeping you safe and the vulnerabilities they find in your system? If your line of business code isn’t correct, they should be letting you know – and doing something about it. The longer a security threat is left unpatched, the bigger the risk to your business grows. If your IT company isn’t addressing security vulnerabilities, you may wake up one day to discover your systems have been compromised – hackers work fast, and you need to ensure you’re covered from every angle. As soon as we get set up with your company, we scan your systems for any possible flaws. We’ll look for security vulnerabilities and anything that’s been improperly installed, and then we’ll address exactly how we’re going to fix it. 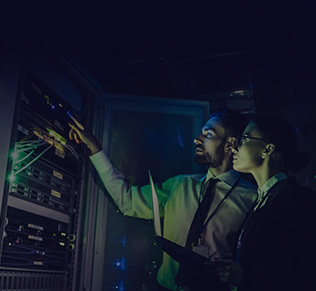 You need an IT team that is up-to-date with compliance requirements for your industry and understands how to keep your system functioning at its peak. 24/7 remote monitoring allows us to keep an eye on your systems at all times so if an issue or vulnerability occurs, we can patch it right away to prevent downtime. Regular meetings with your IT company are crucial. We keep you in the loop about what’s going on with your systems and what needs to be done to keep you protected. Plus, you can air any concerns you might have so we’re always on the same level. To combat any future issues, we back up and encrypt all of your important data, files and applications so if a disaster strikes or your systems fail, you’ll always have access. To get in touch with an IT company that will keep you in-the-loop about your system security, contact Digivie. Send us an email at info@digivie.com or reach out by phone ay (613) 277-2312 .